Becky Garrett presented: North Carolina Board of Recreational Therapy Licensure (NCBRTL) has Traveled Far This Year, Come Here the Changes Made at the North Carolina Recreational Therapy Association Conference on Monday, October 15, 2018. Becky serves as the Executive Director for NCBRTL. North Carolina is recognized as one of the four states that requires a license to practice Recreational Therapy. The other three states include: Oklahoma, New Hampshire, and Utah. How many people are licensed? An individual with the Certified Therapeutic Recreation Specialist (CTRS) credential who practices in North Carolina without a license would be in violation. If any person is providing recreational therapy (as defined by the Standards of Practice) must be licensed in North Carolina. It takes only one element from section 22 (except F – play) to be practicing recreational therapy. It is important to remember that licensure of recreational therapy isn’t about protecting jobs. The sole purpose of licensure is to protect people. The license to practice recreational therapy in North Carolina is about preventing harm. The license doesn’t own the words, “play” or “recreation” or “activities. The licensing board is not trying to eliminate any of those jobs. Danny Pettry thoughts: Most people are good people who want to do good deeds. However, a person who lacks training and experience providing services for people with serious mental, emotional, and physical health conditions could unintentionally do harm. NCBRTL doesn’t receive any state funds. The board is completely funded by the fees paid by licenses. The board was recognized as one that looked good financially. The number of occupations requiring a license has increased over the years. In 2015, the number was up to 30%. Legislators don’t want this number go grow. Legislators want to decrease regulation. There is regulatory reform. Some legislators want to do away with Licensed Recreational Therapists in North Carolina arguing the number (900 practitioners) is too small. In North Carolina, Twelve (12) of the 80 licensed professionals were listed for elimination, including: NCBRT. Becky argued that it isn’t about the number of Licensed Recreational Therapists. It is about the number of clients receiving services and the potential for harm. One legislator who wanted to do away with licensure argued that the NCBRTL didn’t have a place for web-site complaints. This legislator viewed the board more of a business for the public to file a complaint. There was argument that there weren’t any complaints as well. Becky argued that lack of complaints was due to proactive action taken by the board to protect people. One complaint was that the NCBRTL didn’t have reciprocity with other states. Of course, there are only three other states with licensure in Recreational Therapy and the neighboring states don’t require a license to practice. What can Recreational Therapists do to advocate for protecting patients/ and consumers of recreational therapy services? Contact your representatives. Let them know how you’ve turned around a life through recreational therapy and how licensure protects the people who receive services. Legislators look for facts and numbers and aren’t interested in emotions. There are some key points in North Carolina. There are eight universities in N.C. that are putting out graduates in recreational therapy. 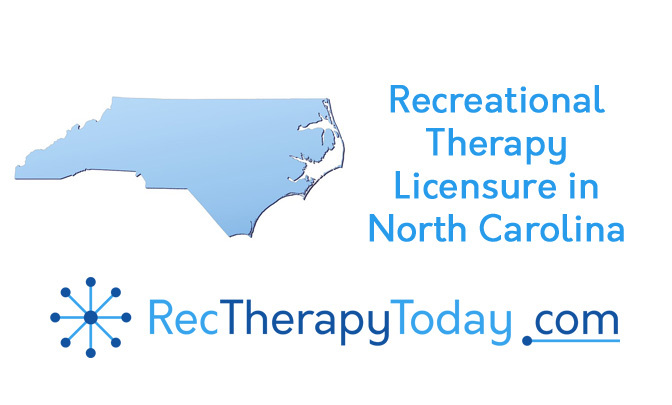 North Carolina is one of the states with the most Certified Therapeutic Recreation Specialists (CTRS). Send an email – but it probably won’t’ be read. Disclaimer: Danny Pettry did his best in writing this review. However, this review may not be fully accurate. This summary is written by Danny Pettry and are not official statements of Becky or the NCBRTL. For information, contact: NCBRTL.